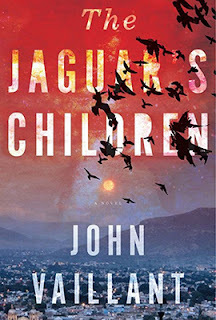 The Jaguar’s Children is journalist and author (who cites as sources Luis Alberto Urrea and Charles Bowden; how could you go wrong?) John Vaillant’s devastatingly powerful first novel. Mexicans and Nicaraguans, men, women, and children, bakers, students and scientists, have paid coyotes (“They were talking fast all the time, but not as fast as their eyes”) to provide safe passage into the United States, welded inside a water truck (“like a bucket of crabs with the lid on and no place to go”). As the book begins, they’ve been abandoned for two days in the Sonoran Desert of Arizona (“la via dolorosa”). Héctor (“Pollo is chicken cooked on a plate— a dinner for coyotes. This is who is speaking to you now.”) finds a contact, AnniMac, with a United States area code in his friend César’s phone and tries to reach her. In an attempt to comfort himself and save his sanity, Héctor takes us with him as he “escapes into his head,” making audio files as he talks to AnniMac about his home. Héctor talks about his family, Mexican history and geography, religion and mythology, culture and sociology, as he describes the diversity of Mexico, not a monolith, and these people as individuals, not stereotypes.